VIGILES BRIGADE, is named for the VIGILES, the first full fire service founded in Rome in 6 A.D. Emperor Augustus formed the VIGILES to protect Rome from the ravages of fire. Serving in the esteemed organization was so respected, that it became one of the most elite and prestigious orders in the entire Roman Empire. Fire Departments/Brigades as we know them today are a direct result of the paramilitary structure and operating systems they developed. This ancient organization, as is today's service, was innovative, developing specialized firefighting tools, pumps and procedures, but their hallmark was the dedicataed and heroic firefighters. The same level of respect continues today as firefighters are regarded as venerated protectors of life and property. As a firefighter, you and your family members and supporters have earned the right to wear the VIGILES BRIGADE mark. 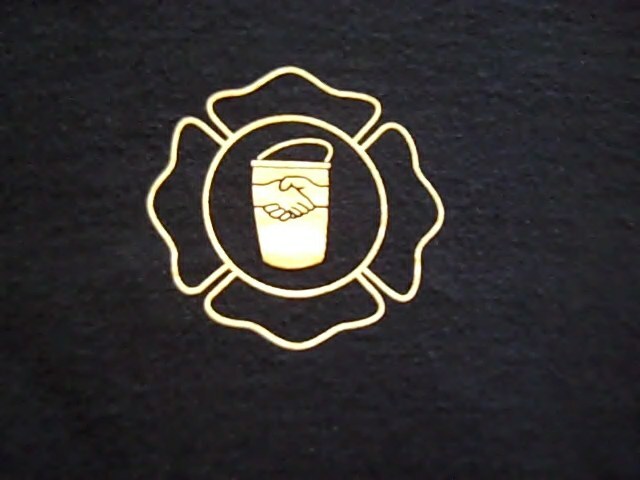 The mark, a fire bucket and the grasping hands, symbolize the tradition and common denominators and fellowship between all firefighters worldwide. VIGILES BRIGADE'S mission is to assist fire fighting and prevention in developing nations. Many of our fellow firefighters are forced to use equipment that is not much better than the VIGILES used over 2000 years ago. A percentage of all profits from the sale of VIGILES BRIGADE apparel is earmarked for fire prevention, fire fighting and life safety efforts in developing nations. Currently supporting the organization; Africa Fire Mission. are honored in a public statue? The Tyler-Davidson Fountain on Fountain Square in Cincinnati, Ohio, USA. 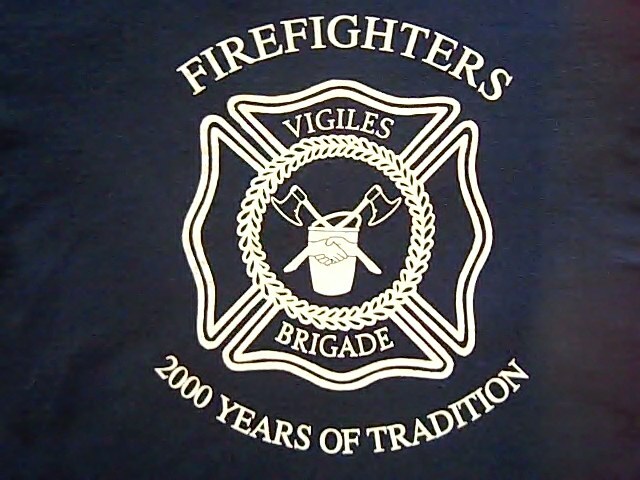 As you wear a high quality official VIGILES BRIGADE marked T-Shirt you will not only exhibit the pride, honor and unity that it represents, you will be providing support for brother and sister firefighters in developing nations. * Please put your shirt size (S - M - LG - XLG) behind your first name in the purchasing boxes.